“I came across your web site by accident. Wow, what a web site, I got a few recipes off it to try them. My husband will be impressed. Love it! 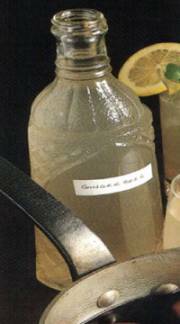 Do you have a ‘tried and true’ recipe for Home Made Ginger Beer? When I was a little girl I remember my Grandfather used to make it and it was the best!, especially on a hot summer’s day. Grandad used to put sultanas in it. Sometimes the bottles would explode. I replied to Raeann explaining that I have a recipe for ginger beer somewhere, but since all my possessions are packed and waiting removal to the East Coast, they are not at all accessible. So, dear readers, can you help? Does anyone have a tried and tested recipe for classic Ginger Beer? Keep those cards and letters rolling in!